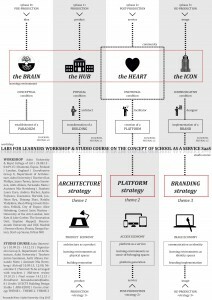 The project called School as a Service (SaaS), developed by Group X at Aalto University Department of Architecture and led by Professors Antti Ahlava and Jarmo Suominen, has just become reality on Otaniemi campus at Aalto University. 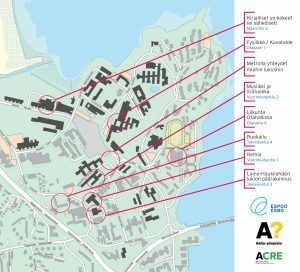 During August 2016, 350 students from Haukilahti Upper Secondary School of the City of Espoo have moved their school activities to Aalto University’s premises. 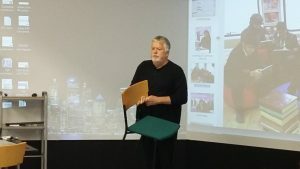 The new school called “Laine” has opened its doors within a core building (Tekniikantie 3, former Puu2 building) to shelter the activities of students and teachers for the next academic year. 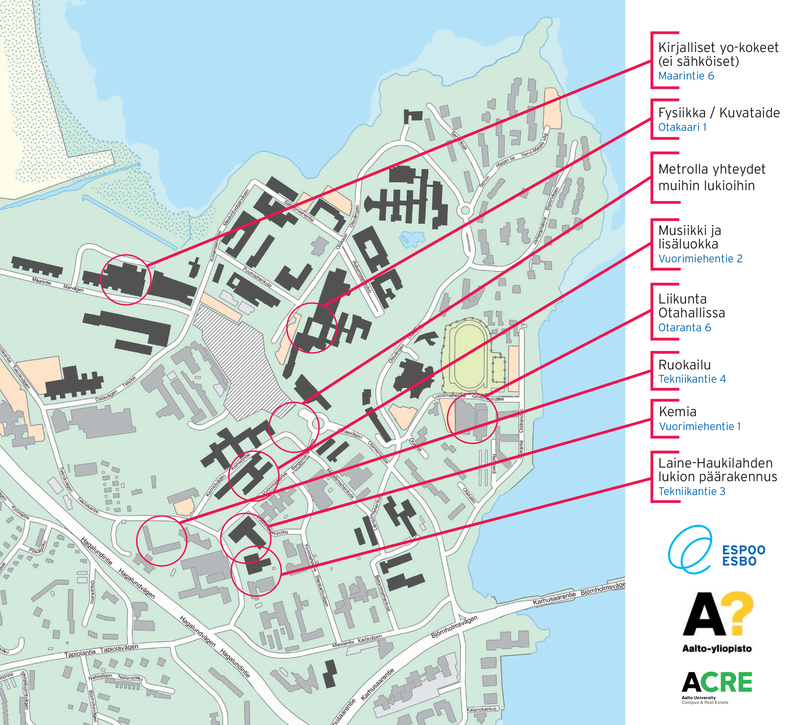 Other premises on the campus will be used by the school community to support their daily learning activities (see map below). The focus in the school is shifting from teaching driven to learning oriented. In industrial age productivity has been the most important asset. Nowadays we need to focus on creativity and innovation capabilities. Innovative learning environments are developed together between teachers, students and other stakeholders. Cost-effective, sustainable and flexible solutions are meant to support learning and joy. SaaS is not defined by traditional ideas of buildings and spaces. It is agile and inspiring network of new and existing local resources. 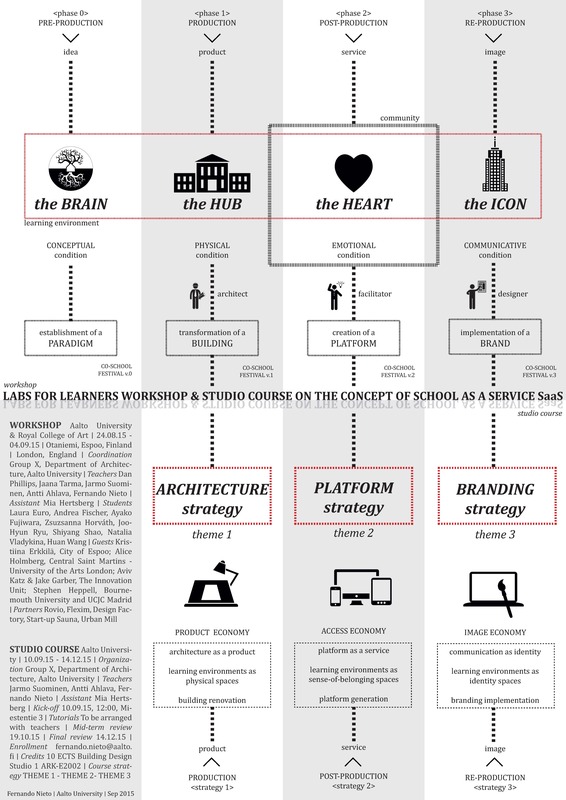 SaaS idea is based on Service Dominant Logic, where students are seen as active participants of the learning processes, and goods (as buildings) have instrumental value to support learning. SaaS solution is based on digital technologies, new methodologies for learning and services designed to support network of resources rather than independent buildings. SaaS is focusing on developing and designing new learning activities and environments for digital natives. 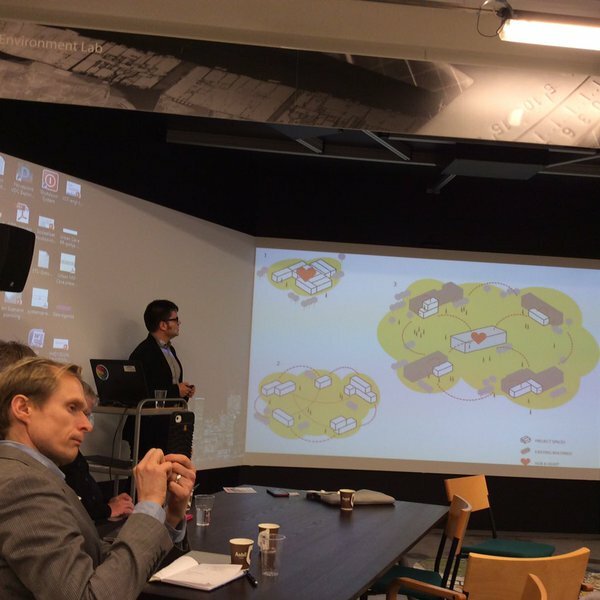 SaaS project has been developed through several meetings, co-creation sessions, workshops, studio courses and exhibitions at different institutions in Finland, United Kingdom, China and Italy, with parallel projects such as JOT project on Flexible Learning Places together with the City of Espoo. 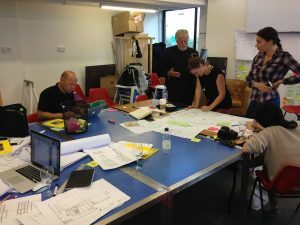 In 2014 and 2015, two education workshops called Labs for Learners were held in Otaniemi (Espoo) and London, as a collaboration between Aalto University Department of Architecture and the Royal College of Art. 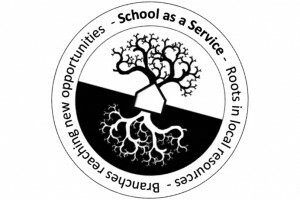 They both developed student and teacher centred learning experiences, flipped classrooms and community based education for young people. 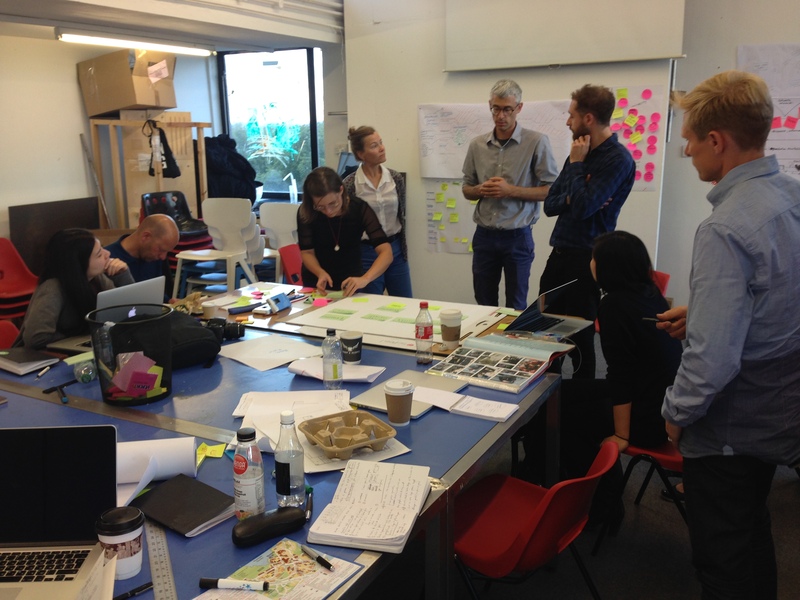 During Autumn semester 2015, the workshop continued as a studio course at Aalto University Department of Architecture. Participants in the different sessions, workshops and studio course included members of Group X Antti Ahlava, Professor of Emergent Design Methodologies; Jarmo Suominen, Adjunct Professor of Service Architecture; Fernando Nieto, postdoctoral researcher of Emergent Design Methodologies; Mia Hertsberg and Saana Rossi, student assistants; and service designers Dan Phillips from RCA and Jaana Tarma from Crastinus. 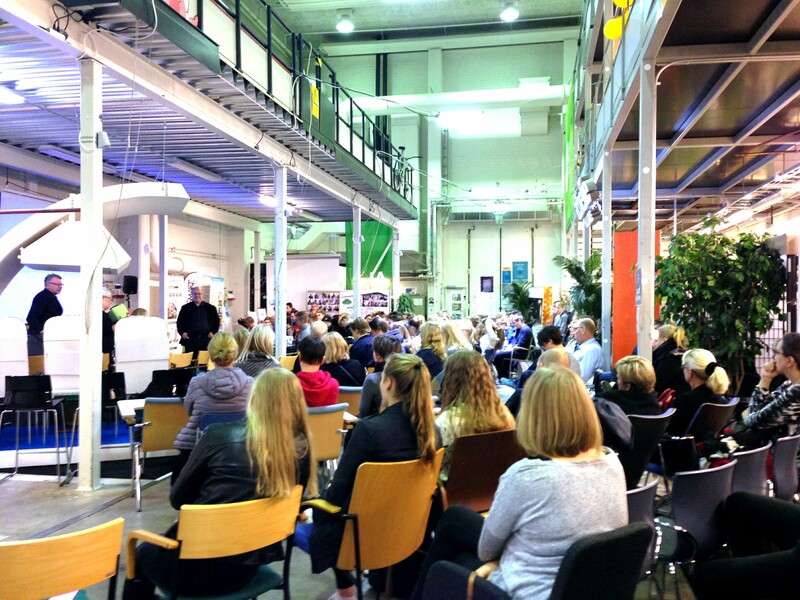 Guest experts included Stephen Heppell, Professor at Bournemouth University and UCJC Madrid; Kristiina Erkkilä, Director of Development at the City of Espoo; Sampo Suihko, Director of Education at the City of Espoo; Tiina Riihimäki, Project Manager at the City of Espoo; Teemu Tuomi, CEO at NRT Architects; Alice Holmberg from Central Saint Martins, University of the Arts London; and Aviv Katz & Jake Garber from The Innovation Unit. Other partners in the workshops were companies such as Rovio and Flexim, and hubs at Aalto University such as Design Factory, Start-up Sauna and Urban Mill. During Spring semester 2016, the studio course New Learning Environments (Environmental Design Studio 1), was held at Tongji University College of Design & Innovation in Shanghai, China, led by Professors Lou Yongqi from Tongji University and Jarmo Suominen from Aalto University. As a result of the project, SaaS Shanghai will open its doors as part of Tongji Aalto Collaborative Shanghai Design & Innovation Institute during next fall 2017. A selection of the results in all studio courses has been exhibited in April in Milan, in the context of the partners meeting for the EU project Human Cities_Challenging the City Scale 2014-2018, project co-funded by the Creative Europe Programme of the European Union where SaaS project is included as part of the experimentation events.